The price of plane tickets depends on several factors: the date (both the date you set off the flight, and the season - high, medium or low), the place of departure and, of course, the airlines, determine the cost. If you were to travel next week, for example, it would be more expensive to travel from country to country. Buying well in advance will make it cheaper to travel to Cancun. Car rental is also more expensive in Florida. In both places, there are hotels for all budgets. In fact, prices do not vary much between similar ones. However, if we make a cost-benefit comparison, most 4 - 5 star hotels in Cancun are all-inclusive; Even the two star hotels at least offer free breakfast. In Florida it’s not the case, almost all hotels include only breakfast so, in fact, the total cost is much higher. The Florida Keys are among the finest places in Florida for swimming with dolphins. It hosts many activities and attractions in its different spots such as Key Largo, Islamorada or Key West. In all these places, you can interact with these marine mammals although most activities have to be paid for separately. 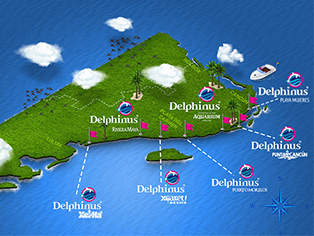 On the other hand, at Delphinuswe offer awesome packages to swim with dolphins and enjoy other attractions, such as Xcaret, Xel-Há or the famous Interactive Aquarium. Not to mention that many foreigners have preferred Cancun for the warmth and hospitality that distinguishes Mexicans. That intangible factor that makes the Mexican Caribbean remain in the memories of all those who visit and stay longer than planned or even not return to their places of origin. To give you an idea, we made this chart taking as an example the next week of August the 8th to the 15th, flying from Mexico City Airport. So now you know. Next time you’re looking to swim with dolphins, Cancun must be the number one option. We promise that your visit will be unforgettable.